Finavera Renewables is boldly moving ahead with the commercial development of its renewable energy wave technology--using the AquaBuOY--with a project in Washington State. The simple buoy has helped guide sailors since the 13th century, and it seems only fitting that a high tech buoy would help guide people of the 21st century toward clean, renewable energy. Finavera Renewables, a publicly traded renewable energy company, is boldly moving forward with the commercial development of its wave technology--the AquaBuOY. The technology uses buoys to capture the energy from waves and turn it into electricity. The company is presently working on several sites to showcase the technology, including one in Makah Bay, Washington. Prior to becoming involved in wave-generated energy, Finavera was--and continues to be--heavily involved in wind-generated energy. The company is currently developing two wind projects in Ireland and 16 in Canada. But Finavera wanted to expand its portfolio, and AquaEnergy, the creators of the AquaBuOY, seemed like a good fit with the company's ambitious and environmentally conscious goals. 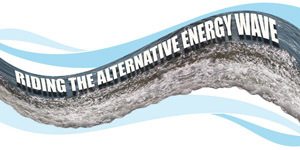 And in June 2006, Finavera acquired AquaEnergy. Now Finavera is developing six wave energy projects around the world, including in South Africa, Portugal, as well as the U.S. Finavera is confident that the wave projects, like Makah Bay, will demonstrate the economic and environmental benefits of wave energy conversion power plants in utilizing ocean resources to generate clean, renewable energy. It believes the research and demonstration of the AquaBuOY pilot plants will contribute to advances in the worldwide ocean energy industry. "The World Energy Council estimates that there is an accessible resource of two terawatts of renewable, clean energy available in the world's oceans," says Jason Bak, Finavera's CEO. "This is a potential resource equivalent to twice the world's current electricity generation. In the U.S. alone, the available wave energy resource is estimated at 2,300 terawatt-hours per year or $80.5 billion annually." It is also estimated that every 200 megawatts of renewable energy generated using the AquaBuOy technology would result in the annual reduction of 130,000 metric tones of C02 emissions. AquaEnergy had successfully tested its technology in the North Sea-- converting wave energy into clean electricity. But now Finavera's focus is to turn the AquaBuOY into a commercial commodity. The AquaBuOY is a floating buoy structure that converts the kinetic energy of the vertical motion of oncoming waves into clean electricity. pass back and forth. As the water passes through, it causes a piston positioned at the midpoint to move up and down--extending and compressing a hose pump. 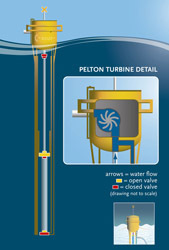 The power stations, which are comprised of buoys, are modular. Each buoy is designed with a 250 kw capacity. So a power station can easily be configured anywhere from one-megawatt to 100-megwatts. In fact, a 100-megawatt plant is being staged by Finavera in Portugal. Bertan Atalay, COO of Finavera, says that the buoys are custom designed for each wave resource. "We have to take into account the 'capacity factor'--an estimated number depending on how much wave resource there is. Unlike a gas-fired facility where you turn the key and you know exactly how much you produce, with waves or wind, you are in nature's hands. "For example, if it's a one-megawatt power plant, the maximum you can produce is one megawatt from four buoys. But the capacity factor may be about 50 percent. So, it will behave as though it's a half-a-megawatt power plant producing all the time, whereas it's actually one megawatt and it's producing sometimes and sometimes not." With the technology's huge potential, a lot of attention will be focused on the Makah Bay pilot site. The one-megawatt power station will be located 3.2 miles off shore, and consist of four buoys, placed 100 meters apart, producing enough energy to supply 150 homes in the Neah Bay area. The Makah Bay pilot is unique in a number of ways. It is the first of its kind, and the success of this project will make it the most advanced wave energy project in the United States. A consortium is working alongside Finavera to help assure that success. They include the Makah Indian Nation, Clallam County Public Utility District, Washington State University, Bonneville Power Administration and Clallam County Economic Development Council. "It's definitely a team effort," says Atalay. "The vision may have started here, but it would have gone nowhere if all these stakeholders didn't actually want it." Another unique aspect to the project is that the power station will be located in a sanctuary owned by the Makah Indian Nation. The wave recourses in the bay were ideal for the AquaBuOY, but in addition the setting will also demonstrate the negligible effects the power station has on the environment. In October 2006, an environmental assessment was successfully prepared for the Makah Bay Pilot project for the Federal Energy Regulatory Commission (FERC). And Finavera has now moved on to the permitting necessary for construction. Atalay, who came to Finavera with extensive experience in renewable energy at both Northland Power and Shell WindEnergy, understands the many steps necessary to execute a vision of this scale. "Today the wave technology is in a pre-commercial state," he explains. "In order for commercial capital to be placed in a project, our turbines need to be commercially tested and certified by outside agencies and companies. Lenders need to see that technology deployed, generating power and put on grids to commercialize it. Makah Bay is playing a significant role in our process." A working power plant at Makah Bay is probably a few years down the road. And it will require everyone at Finavera to confidently and ceaselessly forge ahead. "Every day is a challenge," says Atalay. "We're going through our development work, dealing with our stakeholders in the area, and going through permitting and design." But when it's all in place, and the vision is a reality, Finavera is being seen as a company that will own and operate its assets, much like wind energy is handled today by many companies. You wouldn't know it by Finavera's portfolio of innovative wind and wave projects spread across the globe, but the company is rather young, about four years old. But Atalay believes Finavera's young visionary leaders and experienced staff have what it takes to make it all happen. "We're a young company, but we fiercely believe in the value we create. And not only would we like people to appreciate us and invest in us as a business, but we also have an altruistic reason for doing this. We are truly committed to environmental change. And I think our technology--both on the wave and the wind side--is a great indication of that." When considering the scope of the projects Finavera is involved in, it's surprising to also find out that the company is relatively small. "We're small, but focused," says Atalay. "We have anywhere from 20 to 25 people, with offices located in Vancouver, B.C. ; Dublin, Ireland; Seattle; and Portland, Oregon." He adds that the company is able to handle the complex projects by effectively contracting skills from many outside firms. "We don't see ourselves employing tens of engineers around the clock. We are developing our network fairly wide and far." The company is continuing to grow and expand. And it just went public in January 2007 on the Toronto Stock Exchange's Venture Exchange. "It's a rollercoaster," says Atalay. "I worked for Enron in Europe so I'm not that far removed from a very fast moving sort of marketplace. But this is quite something." He's enjoying the excitement. "Although I've worked on very large projects in the past, it never strikes me as anything but amazing what mankind can do with a few drawings on a piece of paper. Suddenly, things are happening. And I'm always amazed when I find myself to be part of the action, and seeing something big materialize--and we're looking at one of those. I'd like to be around when wave and wind power are mainstream." Where will we see the wave power plants of the future? Just look for the waves. The wave resources in North America are fairly well studied and mapped. Finding the right location for the power plants is the least of Finavera's obstacles. It's an exciting time. "Hopefully, the success of pilots like Makah Bay will translate into acceptance of wave power as an alternative. I think it's going to become a reality in the next few years."